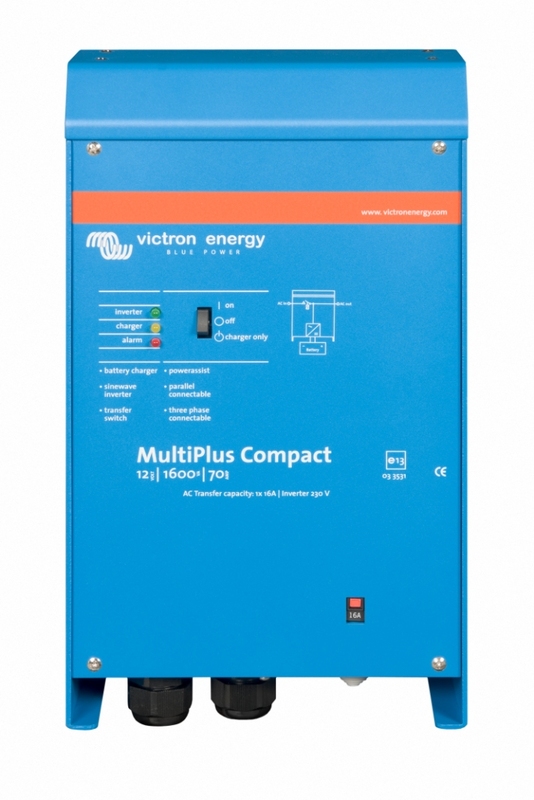 Inverter Victron Multiplus 1600VA (12V-24V) full sine wave,1 AC input for grid/diesel generator, all necessary protections, indications for the battery load, no. power (25 ° C): 1600 VA. The inverters of the Dutch company Victron are a tested solution when it comes to island solutions or UPS systems. The MultiPlus is a powerful true sine wave inverter, a sophisticated battery charger that features adaptive charge technology, and a high-speed AC transfer switch in a single compact enclosure. Next to these primary functions,the MultiPlus has another advanced feature, as two AC outputs. The main output has no-break functionality. The MultiPlus takes over the supply to the connected loads in the event of a grid failure or when shore/generator power is disconnected. This happens so fast (less than 20 milliseconds) that computers and other electronic equipment will continue to operate without disruption. The second output is live only when AC is available on one of the inputs of the MultiPlus. Loads that should not discharge the battery, like a water heater for example, can be connected to this output (second output available on models rated at 3kVA and more). More information in the catalogue..